Auckland, the City of Sails, is the most populous urban area in the country of New Zealand. There are roughly 1.3 million people living in this city that’s settled in the North Island and it’s no surprise why they’ve chosen this beautiful place. 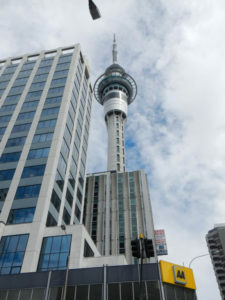 Auckland features 14 “must-see” attractions during your visit that embody stunning natural beauty with big city style. The easiest way to see these sites is through the hop-on, hop-off Auckland Explorer Bus service. It costs $40NZ ($34US) for one day or $65NZ ($55US) for two, and runs roughly between the hours of 9am-5pm. You can buy your tickets and pick up the bus at the Ferry Building near the harbor. This big obnoxious yellow bus that you can’t miss is always staffed with fun and informative staff eager to show you their city. There are discounts available for most of the Entrance Tickets to the tourist stops by showing your bus ticket. This war memorial museum was my favorite stop in Auckland. If you don’t have enough time to visit everything, make sure this is your first stop. Its many levels display fascinating military and natural history along with Maori and Pacific treasures. You could spend all day here. Hey sports fans! This 100-year old building is the largest stadium in New Zealand and home of the 2011 Rugby World Cup Champions, the All Blacks. Also known as Maunga-whau in Maori (language of the indigenous Polynesian people of NZ), this high point gives you a breathtaking view of Auckland and the harbor. Unfortunately the bus can only take you so far up, after the drop-off point it is still a good 300-meter (328 yards) walk to the top. If you’re not a fan of hiking this is probably not your activity of choice. 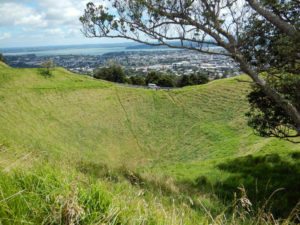 It’s the highest natural point in Auckland and one of 50 volcanoes, all of which were active in the last 600 years. A garden enthusiast’s heaven. Once an abandoned quarry, this little oasis now features the largest collection of camellias along with many other collections of exotic plants. A shopper’s paradise in one of Auckland’s largest shopping mall stocked with 125 retail outlets. Check out the native Kiwi bird here if you haven’t seen one yet. It is the largest collection of native and exotic animals in the country and hosts events like animal encounters all year around. A museum that takes an interactive journey through technological achievements in New Zealand. The collections within tell stories about New Zealand’s advancements in aviation, road transport, military and telecommunications technology. You can discover free vintage tram rides or embark on the Voyager1 4D simulator. This site is a WWll-era lookout bunker that serves a great view for Hauraki Gulf and Waitemara Harbour. From here you can also access Mission Beach and the Michael Joseph Savage Memorial Gardens that are both worth a visit. A beautiful harbor that’s a host for events and the center of activity for the 2000 America’s cup. Visit the harbor to enjoy the relaxing vibe and dine at a harbor side café. An observation and telecommunications tower standing tall at 328 meters (1,076 feet) with breathtaking views of the city up to 80 kilometers (50 miles) in every direction. The tower offers three beautiful levels of viewing areas as well as places to relax and indulge the view with a cup of coffee. A learning center for Antarctic exploration. This unique aquarium was built out of unused sewage pipes which allowed curved tunnels rather than viewing areas with flat panels. It is also the first to use conveyor belts to move people through the viewing areas. The rose garden is a stunning display of a variety of roses and ideally enjoyed during the summer months. Parnell Village is New Zealand’s oldest suburb known for its café’s, galleries, and restaurants. Opened in 1929, this large heritage theater sits 2,378 people in Central Auckland. It’s unique in its atmospheric theater style, meaning the design was to convey impressions of being seated in an outdoor auditorium at night. It creates the illusion of a starlit sky. This Pacific Gothic styled church is renowned for its modern stained glass and architecture. It’s also a home to a memorial garden, a labyrinth, and Terry Stringer’s “Mountain Fountain”. For more photos of Auckland, New Zealand visit our photo gallery.